Are you thinking of remodelling your bathroom? Maybe ripping out your old tub? If so, consider resurfacing your bathtub and tub surround tile by reglazing or installing a custom made acrylic liner instead. Reglazing (or re-enamelling) is an excellent option, and Dr. Tubs Reglazing and Liners can resurface all styles of bathtubs, ceramic tub surround tiles and even sinks. We also specialize in claw foot and cast iron tubs. Alternatively, we can install a Canadian, custom-made liner made from the highest impact-resistant acrylic you can find out in today’s market. Dr. Tubs Reglazing and Liners can create a custom made liner for your tub and wall-surround so they will fit your existing tub and tile like a glove. This option is more durable and meant to out-last reglazing, yet it’s still cheaper than replacing. I cannot say enough on the quality of work, quick response to calls and how polite your employee was. With e-mailed photos's of my tub, had the quote immediately, appointment within a week, and it was all just terrific. You were recommended to me by my neighbor, and I will be happy to pass this on to anyone who asks. The price to have it re-glazed vs a cover or new tub cannot be compared. Be sure you know what you want before you pick any of the options. This was our best option! Hi Laura S. Thank you for using our services and we agree, it was the best decision to reglaze your bathtub. All our technicians are professionally trained and we strive to make the customer happy by making it look brand new. Enjoy your newly refinished tub and thanks again. Sincerely, Dr. Tubs Reglazing. They did a great job with the regaling of our tub. The admin staff and worker were both professional and very helpful. Im very happy with the service and product that was provided, as well as the staff before after and during the process. The tub looks fantastic. I would recommend this company to anyone wanting to do a reglaze. Great job. Reglazed bathtub looks like new. Great value for price. Technician was very professional and knowledgeable. Would use their services again and highly recommended. Work was completed on day and time specified. Thank you Dr Tubs for doing a fantastic job reglazing my tub!! Previously done by another company and they did a horrible job!! With Dr Tubs my Tub looks brand new!! Quality Service, very perfessional! Thanks to Enza too for making it so easy!! My Husband and I are extremely happy with the service received from Dr. Tubs. They were fast, friendly and clean. Would recommend to anyone thinking about reglazing a tub. HI 3lovelychildren, Thank you for taking the time to write a review for us on yp.ca. It's great to hear that you were extremely happy with the service provided and that our technician was friendly, clean and fast. Thank you again for this recommendation and Dr. Tubs Reglazing hopes you enjoy your newly refinished bathtub. First time using Dr. Tubs (I found their website after a google search) I am blown away by how amazing my old claw foot tub looks. In addition, the staff were amazing - Enza answered all my questions about the safety of the products and concerns I had about the fumes bothering my children. The technician was efficient and super nice, left the bathroom surprising clean given the work that was done! I highly recommend them! Second time using Dr. Tubs and they somehow surpassed my already high expectations. Enza set up the project to suit my schedule and then a professional, courteous and highly skilled technician rejuvenated an old tub in a timely and cost effective manner. Now my entire bathroom sparkles. Couldn't possibly be more pleased. Highly recommended. Hi Redtux, Thank you for taking the time to write this review. Dr. Tubs Reglazing really appreciates hearing back from customers, especially repeat customers! We are so glad that we surpassed your high expectations from start to end, from our customer service to scheduling and to the highly professional technician's we use that brought your bathtub back to life. Thank you for the recommendation and enjoy using your newly refinished bathtub. 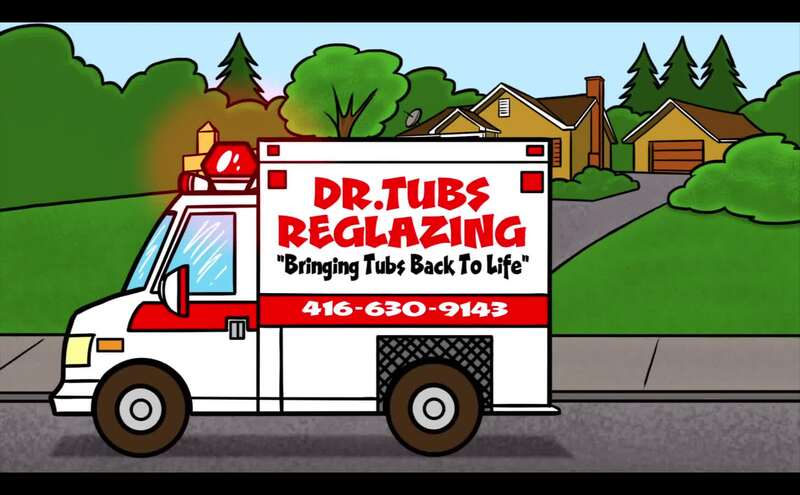 All the best, Dr. Tubs Reglazing of Toronto, By the way, if you have any after pictures, please feel free to send them to us for posting. I am extremely happy with my new re-glazed bathtub; wonderful service, work and very affordable. I will definitely recommend Dr. Tubs to family and friends. I needed a quick, economically viable, quality renovation of my rental property’s bathroom. It had outdated, brown tiles and an almond-coloured tub. Inside of a few hours, the bathroom went from awful to pristine, more fashionable white. Dr. Tubs helped me bypass an expensive reno with a simple solution for my tiles and tub that looks great. Dr. Tubs did a great job, we are very happy with their service! My tub looks great and the after care details eere very helpful. Very professional, I would definitely recommend. Dr. Tubs you were awesome. My tub looks great ! Great job on the two tubs. They look like new and completely make the bathroom look fabulous. Very professional work. I would recommend Dr. Tubs to anyone. Thanks again to the Dr. Tubs team. Thank you for such a wonderful job! My tub has come back to life after 20 years. Dr.tubs is very professional and worthy of an award !